A pioneering solar energy project is using green technology to improve the lives of isolated villagers living beyond the reach of power lines on Argentina’s windswept Andean plains. Llama-herding communities have relied on firewood to cook and to heat their mud-brick homes for centuries in this remote corner of the vast South American country, causing deforestation and soil erosion. Now residents of the village of Misa Rumi in Jujuy province are cooking their lunchtime soups and stews on solar-fired stoves and installing solar-heated showers as part of a project led by a local NGO, the EcoAndina Foundation. “We use the solar stove every day and it works well. You can cook soup, or whatever you want. It’s not bad at all, I think it gives good results,” said Julian Martinez, who scrapes out a living as a gold panner, as he stirred a pot of soup balanced on the large, aluminum dish. With the use of a built-in sundial, the solar stoves are tipped to face the strongest sun and can set light to a piece of paper within seconds. They have proved popular, saving villagers the work of gathering scarce firewood or buying pricey canisters of natural gas. Elsewhere in Misa Rumi, the scorching Andean sun is used to heat a communal bakery and solar-powered water pumps that guarantees irrigation for the residents’ vegetable patches. Misa Rumi lies at some 3,750 meters (12,000 feet) above sea level, but a solar heating system at the village school takes the edge off plunging early morning temperatures in the winter by transmitting the sun’s heat through black roof panels. Many of the village’s solar energy systems have been installed by the EcoAndina Foundation, which has been working since 1989 in Misa Rumi and 30 other villages in the La Puna area. “The technology we implemented set out to improve people’s quality of life and reduce firewood consumption, which produces a lot of desertification in the region,” Silvia Rojo, president of the EcoAndina Foundation, told Reuters Television. “It’s caused a lot of interest in other Latin American countries and other parts of the world,” she added. Deforestation is threatening slow-growing regional plant species such as the yareta, which makes excellent fuel for fires but takes hundreds of years to grow. Project leaders hope residents of this barren region will eventually be able to earn carbon credits for reducing the amount of carbon dioxide they produce by cutting down trees and burning firewood and natural gas. 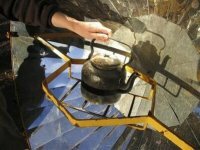 “One solar cooker can save up to two metric tons of carbon dioxide in a year if a family uses it constantly and that’s quite a lot if you think there are about 40,000 people in this region,” EcoAndina Foundation engineer Christoph Muller said. As well as making everyday life more comfortable in the bleak landscape of the high Andes, project leaders say green technologies are helping protect traditional ways of life.